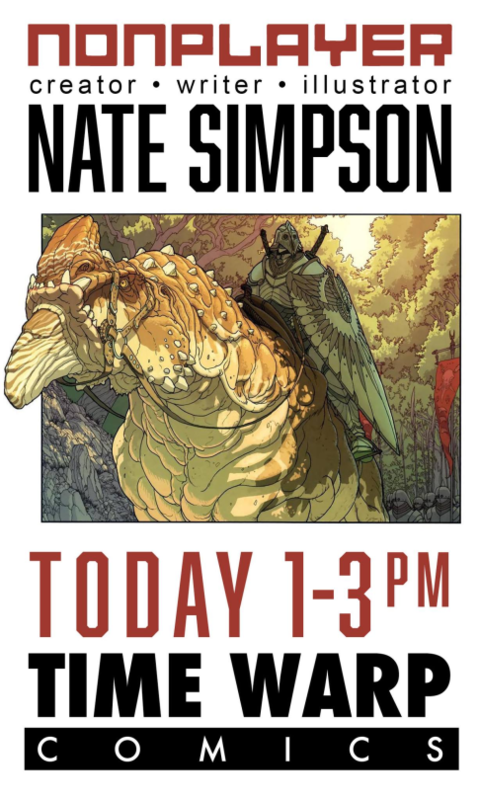 It's been a pretty wacky month, and I'll write again soon about all that's happened, but first, a quick announcement: I'll be doing my last scheduled signing tomorrow, June 27th, at Time Warp Comics in Boulder, CO from 1PM to 3PM. I'm flying a long way for this one, and we haven't given folks much notice, so any help getting the word out would be most appreciated! Denver people, too! It's not that far, right? If I may appeal to your self-interest, one thing that I have learned over the last couple of weeks is that first printings of Nonplayer 1 are now selling on Ebay for like a trillion dollars each, and they go for a shmazillion dollars if they're signed. Even second printings are starting to fetch silly sums. Hooray for scarcity! So if you have one of those, bring it by Time Warp to get it signed! Also, I feel like I'm getting tweeted/emailed a lot by LA folks who want me to do a signing. I would love to come down if a shop invites me, so feel free to bug your favorite shop on my behalf. Just here to say I bought and read the first two issues of Nonplayer. They were both awesome! Hope you make a thousand issues. Just reread the first two issues. Still as great as I remember. Art style is on point. Found a lot more little details the second time around. Ive still got hopes for more! Thanks Anthony! Yes, more are on the way. Watch this space!